Over the past two years, a significant disinflationary impulse has dampened nominal activity around the world. The slowdown in real growth in that period has been modest – global real GDP expanded at a 2.7% annualised pace, right in line with our potential growth estimate. However, commodity prices and producer prices declined sharply, which pushed consumer price inflation (CPI) down to historic lows outside of a recession. All collapsed at their fastest pace in decades, excluding the Global Crisis (Figure 1). This in turn, has weighed more heavily on real activity than we had initially expected. But as the disinflationary impulse fades, both nominal and real growth should normalise. 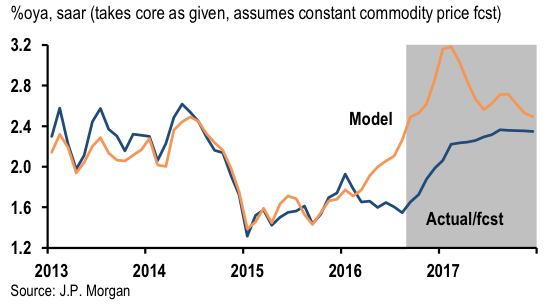 In effect, the disinflation impulse reflects a significant positive supply shock in commodities (oil, specifically), reinforced by a somewhat larger than initially assumed negative demand shock. These shocks produced a dramatic rotation in regional and sectoral performance. The emerging markets and commodity producers weakened significantly, with some countries (Brazil and Russia) experiencing deep recessions. Income shifted away from corporates and toward households as inflation slid sharply. This boosted consumption, primarily in the developed markets, while global capital spending stalled. With the supply shock looking to have stabilised and the demand shock fading, the pricing complex should normalise. We expect producer price inflation to move back into positive territory and consumer prices to rise 2.5% in the coming year – a return to its 2013-14 pace. The pickup should lift corporate profit growth and, in turn, boost business equipment spending and help return the global economy to more trend-like growth. It should also lift inflation expectations, adding to stimulus by lowering real interest rates and further reinforcing the fading of the demand shock. 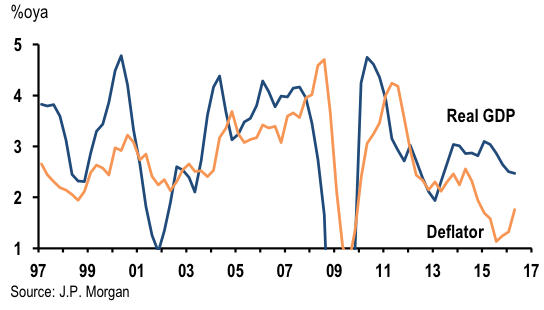 Demand shocks are also fading as prior developed market fiscal tightening has turned neutral (Lupton and Saijid 2016). The latest signs are that this rotation in pricing, profits, and real activity is underway. After bottoming in February this year, global producer price inflation has surged to 3.5% annualised in the six months to August – its fastest such pace in five years. 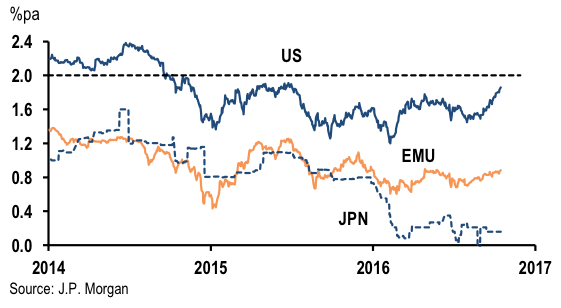 Global consumer prices have also accelerated from their February lows and are up 2% annualised in the six months to August (Figure 2). Inflation expectations remain depressed but there are some hints of a firming in the US. The early readings also show a momentum-shift upward in corporate profit growth. For now, the acceleration is from large declines to stability, but we forecast global corporate profits advancing 5-10% in 2017 as nominal GDP accelerates. The leading signs of improvement align with recent indications of a pickup in capital spending. If these trends continue, the fading disinflationary shock will be a key foundation for extending the life of the expansion in the face of gradual Fed hikes over the coming year. When commodity prices began tumbling in 2014 (and kept tumbling through to early 2016, with some ups and downs), we highlighted an identification problem. To the extent that this tumble reflected supply developments, it would boost global growth. By contrast, large price declines from demand weakness often signal impending recession. There were clear signs that both forces were at play – big increases in the production of energy and other commodities at same time that the emerging market credit boom was starting to deflate. In the event, global GDP prices (i.e. the ‘deflator’) decelerated sharply in 2014 and 2015, but real GDP growth also stepped down (Figure 3). We had forecast the commodity supply shock would induce an income rotation toward higher marginal propensity to consume households, which would more than offset the concentrated hit to business spending. However, the hit to business equipment spending, combined with the emerging market demand shock, was larger than we had anticipated. 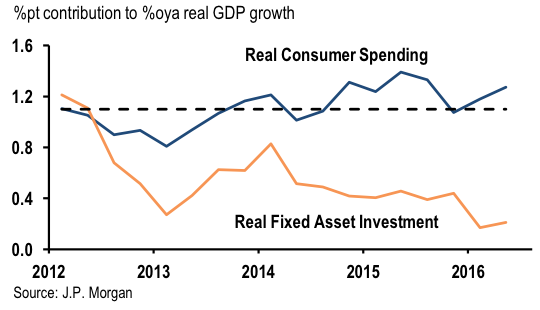 Real consumer spending did accelerate, but this was more than offset by a much sharper deceleration in real fixed investment (Figure 4). It now appears that, while a significant share of the collapse in commodity prices owed to a positive supply shock, headwinds to growth across much of the emerging markets and parts of the developed markets constituted a larger negative demand shock than we had anticipated. 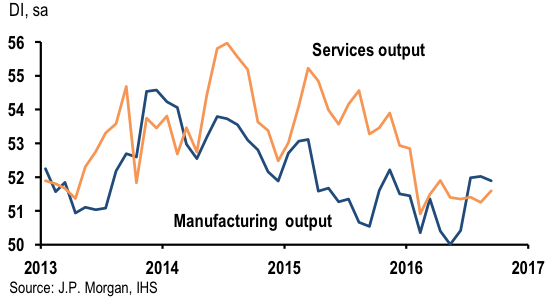 This demand shock appears to have been concentrated in the goods sector, as global services provided a much-needed buffer to the slide in goods production over the past two years (Figure 5). Overall, global nominal GDP slowed to a weak 4% annualised pace in the year ending 1Q16 from a 5.8% average annualised rate from 2010 through to mid-2014. This is the weakest showing on record outside of a recession. The collapse in nominal growth resulted in a significant slide in corporate profits. Globally (on a GDP-weighted basis), earnings per share of listed companies have tumbled roughly 20% since mid-2014. In a recent report, we underscored the linkage between the profit cycle and the business cycle, noting that the recent decline in profit growth over the past two years is a rare outcome typically reserved for recessions (JP Morgan 2016). Not surprisingly, business equipment spending slumped (Figure 6). 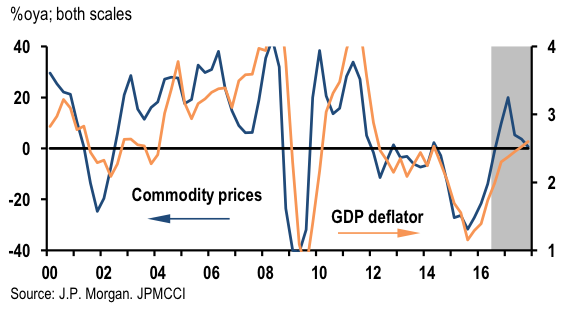 Initially the commodity price collapse drove the disinflation impulse. 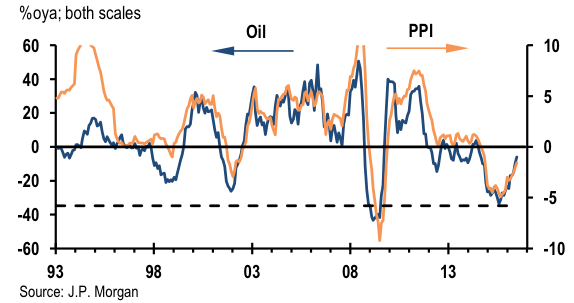 As commodity prices have bounced from their February lows, the pressure on the broad inflation complex is reversing. The most obvious imprint will be felt on CPI. 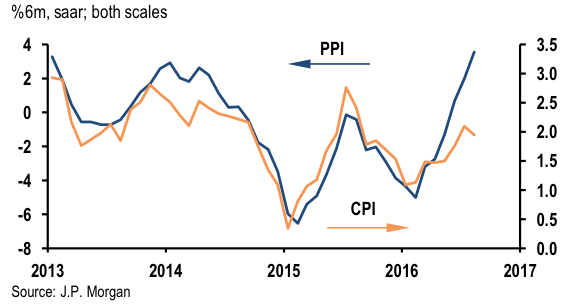 We have long expected a jump in global CPI inflation but have been somewhat surprised that the rise has yet to materialise (Figure 7). We attribute part of this surprise to a lack of pass-through of the recent jump in oil prices into consumer energy prices. 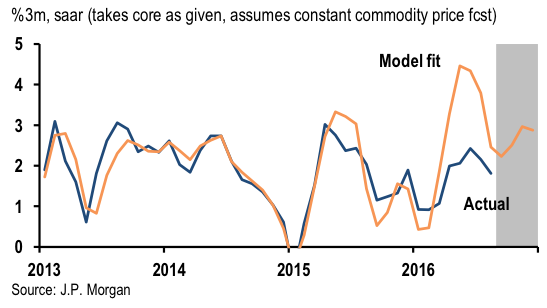 However, the outlook still projects that global CPI will rise nearly a full percentage point over the coming months and the model tracking-error suggests the risks are skewed to the upside. The latest data suggest inflation is already starting to strengthen. Over the three months through August, the global CPI has advanced 1.8% annualised. This three-month pace is off a little from June, but is well above the 0.9% lows from earlier this year (Figure 8). The unwinding disinflation impulse will have broader ramifications. Pricing has been weakened across much of the goods sector but the large declines are stabilising (Figure 1) and overall global GDP price inflation is already starting to rise. Global GDP inflation slumped from 2.5%oya in mid-2014 to a low just above 1% in late 2015 (Figure 9). With commodity prices rising, global GDP inflation has picked up back to 1.7%oya as of 2Q16. If our forecast is right, GDP inflation should strengthen materially to 2.6% by the end of 2017. As consumer and GDP price inflation picks up, inflation expectations should firm. This will likely be a welcome relief to central banks that have struggled to find new tools to shore up their respective nominal anchors. While inflation expectations in the Eurozone and Japan remain depressed, US inflation expectations are showing some hints of a rise of late (Figure 10). 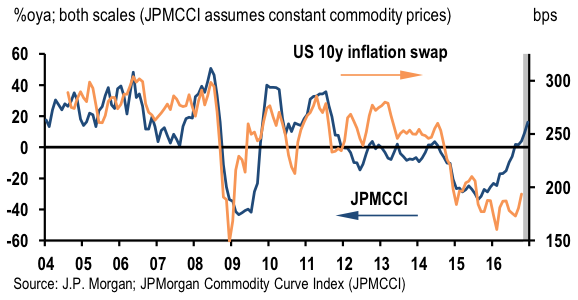 The recent pickup in commodity price inflation suggests more firming is in train. After bottoming at -34%oya in mid-2015, commodity price inflation (as measured by the J.P. Morgan Commodity Curve Index) is set to reach 16%oya by year-end. The US ten-year inflation swap has lagged this recovery but the latest firming points toward a correction (Figure 11). The latest signals suggest that a rebound in global profits is beginning and this is already translating into acceleration in global business equipment spending. For profits, we look to the MSCI earnings per share data. Earnings are reported on an average year-over-year basis and computed on a rolling basis as companies report them. These are computed by country and aggregated using GDP-weights. Based on this metric, global corporate profits contracted 15% in the year ending in 2Q16 (Figure 6). However, earnings per share have stabilised in recent months. The year-average pace of earnings has actually inched up 1% in the three months through September.1 The stabilisation in earnings is broadly based across the developed and emerging markets (Figure 12). These latest developments should not come as a surprise given the fading of the disinflationary shock noted above. With global nominal GDP growth projected to rebound, global corporate profit growth could accelerate to nearly 10% in 2017 (Figure 13). The impact of rising earnings growth is powerful. The slide in profits over the past two years has weighed heavily on business equipment spending, as indicated in Figure 6. As such, the stabilisation and likely pickup in profits should provide an important boost to capital spending. In past research, we highlighted more formally in a regression model the strong role profits played in driving the capital expenditure (capex) cycle. 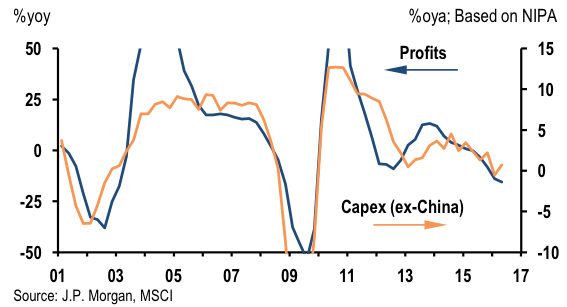 The recent stabilisation in global profit growth bodes well for capex, in this regard. Indeed, our monthly global capex proxy (based on capital goods imports and capital goods shipments data) has aligned remarkably well with the higher-frequency percentage 3m/12m turn up in global profit growth (Figure 14). 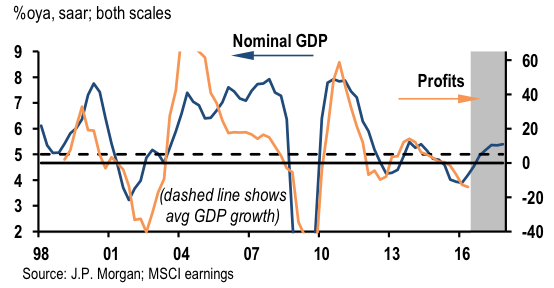 Assuming nominal GDP growth accelerates to roughly a 5% annualised pace over the coming year and generates a pickup in profit growth to a near-10% pace, global capex would strengthen by 5%-10%. We do not project capex to expand as robustly as this, but the results point to two conclusions. 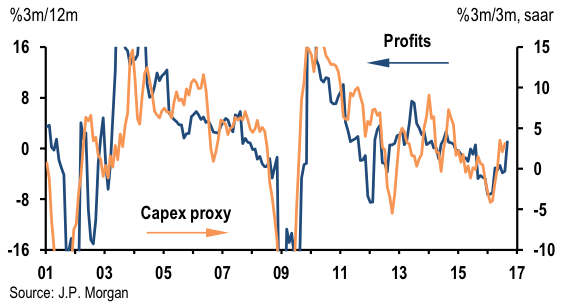 First, a capex rebound is in the offing if profits recover alongside the fading disinflationary impulse. Second, if the pass-through of rising prices to earnings is as strong as suggested here, the risk to the projected capex recovery would be skewed to the upside. If the fading disinflationary impulse owes to the fading commodity supply shocks and emerging market-dominated demand shocks over the past two years, it stands to reason that the emerging markets would be the biggest beneficiary. Indeed, assuming the firming in profit growth translates into some acceleration in capex, the impulse to the goods-producing sector should be meaningful and translate into a bigger boost in the more goods-intensive emerging markets. Similarly, the rise in commodity prices of late will support emerging market incomes somewhat more via the terms of trade channel. 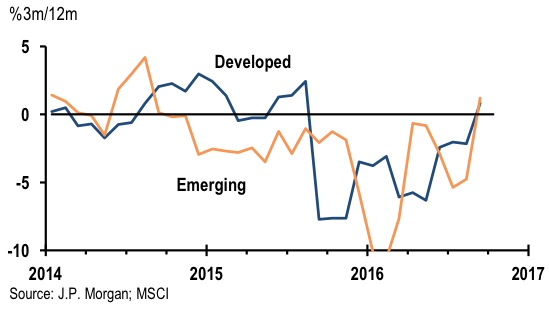 Not unrelated but providing an added boost, Brazil and Russia’s exit from recession underlies a big part of the emerging market growth upswing in our forecast. That said, with emerging market leverage still near all-time highs, the slowing in the credit cycle will remain a headwind. Moreover, while commodity prices have moved up, they remain well below their prior peaks, and the end of the commodity super-cycle (driven in part by China’s rotation away from commodity-intensive growth) means that the commodity-producing emerging markets need to adjust to a new business model. This adjustment will weigh on growth in the near and medium term. J.P. Morgan (2016), Profit stall threatens global expansion, Special Report, 21 June. Lupton, J and Z B Saijid (2016), “The spirit is willing but the fiscal stimulus is weak”, J.P. Morgan Research, 5 August. 1 Because the MSCI data refer to earnings over the past year, the level of earnings is a 12-month average. We then focus our analysis here on the %3m growth rates. As such, the frequency is a %3m/12m basis (%3m change of a 12m average). Analysts' Compensation: The research analysts responsible for the preparation of this report receive compensation based upon various factors, including the quality and accuracy of research, client feedback, competitive factors, and overall firm revenues. Principal Trading: J.P. Morgan and/or its affiliates normally make a market and trade as principal in fixed income securities discussed in this report. Legal Entities: J.P. Morgan is the global brand name for J.P. Morgan Securities LLC (JPMS) and its non-US affiliates worldwide. J.P. Morgan Cazenove is a brand name for equity research produced by J.P. Morgan Securities plc; J.P. Morgan Equities South Africa Proprietary Limited; JPMorgan Chase Bank, N.A., Dubai Branch; and J.P. Morgan Bank International LLC. J.P. Morgan Securities Inc. is a member of NYSE and SIPC. JPMorgan Chase Bank, N.A. is a member of FDIC. U.K.: JPMorgan Chase N.A., London Branch, is authorised by the Prudential Regulation Authority and is subject to regulation by the Financial Conduct Authority and to limited regulation by the Prudential Regulation Authority. Details about the extent of our regulation by the Prudential Regulation Authority are available from J.P. Morgan on request. J.P. Morgan Securities plc (JPMS plc) is a member of the London Stock Exchange and is authorised by the Prudential Regulation Authority and regulated by the Financial Conduct Authority and the Prudential Regulation Authority. J.P. Morgan Equities South Africa Proprietary Limited is a member of the Johannesburg Securities Exchange and is regulated by the Financial Services Board. J.P. Morgan Securities (Asia Pacific) Limited (CE number AAJ321) is regulated by the Hong Kong Monetary Authority. JPMorgan Chase Bank, N.A., Singapore branch and J.P. Morgan Securities Singapore Private Limited are regulated by the Monetary Authority of Singapore. JPMorgan Securities Japan Co., Ltd. and JPMorgan Chase Bank, N.A., Tokyo Branch are regulated by the Financial Services Agency in Japan. J.P. Morgan Australia Limited (JPMAL) (ABN 52 002 888 011/AFS License No: 238188) is regulated by ASIC and J.P. Morgan Securities Australia Limited (JPMSAL) (ABN 61 003 245 234/AFS License No: 238066) is regulated by ASIC and is a Market, Clearing and Settlement Participant of ASX Limited and CHI-X. J.P. Morgan Saudi Arabia Ltd. is authorized by the Capital Market Authority of the Kingdom of Saudi Arabia (CMA), license number 35-07079. General: Information has been obtained from sources believed to be reliable but J.P. Morgan does not warrant its completeness or accuracy except with respect to disclosures relative to JPMS and/or its affiliates and the analyst’s involvement with the issuer. Opinions and estimates constitute our judgment at the date of this material and are subject to change without notice. Past performance is not indicative of future results. The investments and strategies discussed may not be suitable for all investors; if you have any doubts you should consult your investment advisor. The investments discussed may fluctuate in price or value. Changes in rates of exchange may have an adverse effect on the value of investments. This material is not intended as an offer or solicitation for the purchase or sale of any financial instrument. J.P. Morgan and/or its affiliates and employees may act as placement agent, advisor or lender with respect to securities or issuers referenced in this report. Clients should contact analysts at and execute transactions through a J.P. Morgan entity in their home jurisdiction unless governing law permits otherwise. This report should not be distributed to others or replicated in any form without prior consent of J.P. Morgan. U.K. and European Economic Area (EEA): Investment research issued by JPMS plc has been prepared in accordance with JPMS plc’s Policies for Managing Conflicts of Interest in Connection with Investment Research. This report has been issued in the U.K. only to persons of a kind described in Article 19 (5), 38, 47 and 49 of the Financial Services and Markets Act 2000 (Financial Promotion) Order 2001 (all such persons being referred to as “relevant persons”). This document must not be acted on or relied on by persons who are not relevant. Any investment or investment activity to which this document relates is only available to relevant persons and will be engaged in only with these persons. In other EEA countries, the report has been issued to persons regarded as professional investors (or equivalent) in their home jurisdiction. Japan: There is a risk that a loss may occur due to a change in the price of the shares in the case of share trading, and that a loss may occur due to the exchange rate in the case of foreign share trading. In the case of share trading, JPMorgan Securities Japan Co., Ltd., will be receiving a brokerage fee and consumption tax (shouhizei) calculated by multiplying the executed price by the commission rate which was individually agreed between JPMorgan Securities Japan Co., Ltd., and the customer in advance. Financial Instruments Firms: JPMorgan Securities Japan Co., Ltd., Kanto Local Finance Bureau (kinsho) No. 82 Participating Association / Japan Securities Dealers Association, The Financial Futures Association of Japan, Type II Financial Instruments Firms Association and Japan Investment Advisers Association. Australia: This material is issued and distributed by JPMSAL in Australia to “wholesale clients” only. This material does not take into account the specific investment objectives, financial situation or particular needs of the recipient. The recipient of this material must not distribute it to any third party or outside Australia without the prior written consent of JPMSAL. For the purposes of this paragraph the term “wholesale client” has the meaning given in section 761G of the Corporations Act 2001. New Zealand: This material is issued and distributed by JPMSAL in New Zealand only to persons whose principal business is the investment of money or who, in the course of and for the purposes of their business, habitually invest money. JPMSAL does not issue or distribute this material to members of "the public" as determined in accordance with section 3 of the Securities Act 1978. The recipient of this material must not distribute it to any third party or outside New Zealand without the prior written consent of JPMSAL. Canada: The information contained herein is not, and under no circumstances is to be construed as, a prospectus, an advertisement, a public offering, an offer to sell securities described herein, or solicitation of an offer to buy securities described herein, in Canada or any province or territory thereof. Any offer or sale of the securities described herein in Canada will be made only under an exemption from the requirements to file a prospectus with the relevant Canadian securities regulators and only by a dealer properly registered under applicable securities laws or, alternatively, pursuant to an exemption from the dealer registration requirement in the relevant province or territory of Canada in which such offer or sale is made. The information contained herein is under no circumstances to be construed as investment advice in any province or territory of Canada and is not tailored to the needs of the recipient. To the extent that the information contained herein references securities of an issuer incorporated, formed or created under the laws of Canada or a province or territory of Canada, any trades in such securities must be conducted through a dealer registered in Canada. No securities commission or similar regulatory authority in Canada has reviewed or in any way passed judgment upon these materials, the information contained herein or the merits of the securities described herein, and any representation to the contrary is an offense. Korea: This report may have been edited or contributed to from time to time by affiliates of J.P. Morgan Securities (Far East) Limited, Seoul branch. Brazil: Ombudsman J.P. Morgan: 0800-7700847 / [email protected]. Revised October 8, 2016. Copyright 2016 JPMorgan Chase Co. All rights reserved. Additional information available upon request.